Nice outfit, hairstyle is not the best in my view. Great look of the Duchess Catherine. The skirt is a bit short, but it suits her. I´m not shure about the makeup, I do not like this dark eyebrows or is it her enthusiasmus? She needs to change her hair color and put a little weight on . 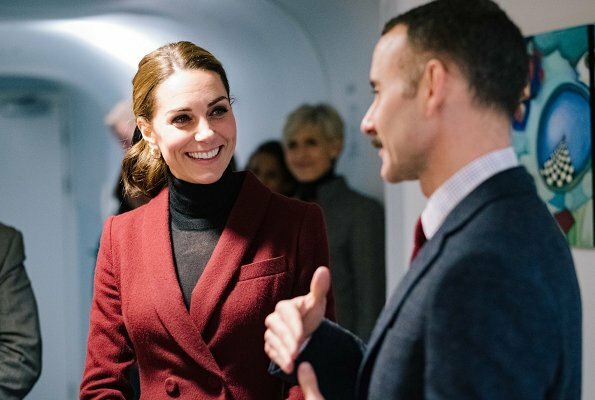 The comments about Kate's weight need to stop. No one here knows anything about her weight, they are only making assumptions. It is a "none of your business" topic. Davion and Chardonn8r, I totally agree with you! Agree with both comments, yes Kate decides for herself what is the weight she wants to have. Change her obviously natural haircolour? I would say its a boring outfit that shrunk a few sizes. I agree. The suit looks too small even for Kate. I like the colour and the jacket, I don't particularly have any objection to short skirts in themselves but I find this one a bit "little girlish" - I think the outfit would work better with either a longer skirt or short but straight. The colour of the coat is perfect for her. I also like the ponytail. She looks lovely! Catherine sieht gut aus-und sie soll so bleiben, wie sie ist. Sie hat schönes Haar und eine tolle Figur. Das Outfit ist nett, wobei der Rock mir persönlich zu kurz ist. Das steht Frauen unter 30.
nice colour and I am pleased to see another re-wear. However, as mentioned above, this suit looks both too small and too short. It's not terrible, but she has so many better options already in her closed, that it makes me wonder why this particular one? There are several suits I can think of that fit her better, have a more appropriate hemlines and have not seen more than one outing so far. A friend once shared a beauty secret: start out underweight, at 40, gain 3 pounds, at 45, gain another 3 pounds, same at 50, 55, 60, etc. As your friends get wrinkly, your face will plump up little by little... Result: you’ll look younger than everyone else! Patricia, don't be cross with me, but this is not a "beauty secret", it is pure sexism. It is regarding a womans face and body from an outside perspective and determine, what is "right" and what is "wrong" with her. If you want to feel beautiful, there is a much better way: DANCE. While dancing you have a connection between body, mind and soul. Dance at least once a week in company of nice people and you will feel comfortable. Some may prefer the energy of ChaCha and Jive, others the elegance of Slowfox and Waltz (hubby and me). If you do not like ballroom-dancing, choose HipHop, Linedance, modern Dance, whatever you like. Look at dancing people - they smile, they are beautiful, each in their own way! I do not think Catherine needs to put on any weight. She looks healthy and if you look at the pics of her pre-baby, she has just returned to that size. This color is great for her and love it with the black. I do not mind the shorter skirt, but wish the jacket was a bit longer. Nice tights and shoes, very fall/winter look. 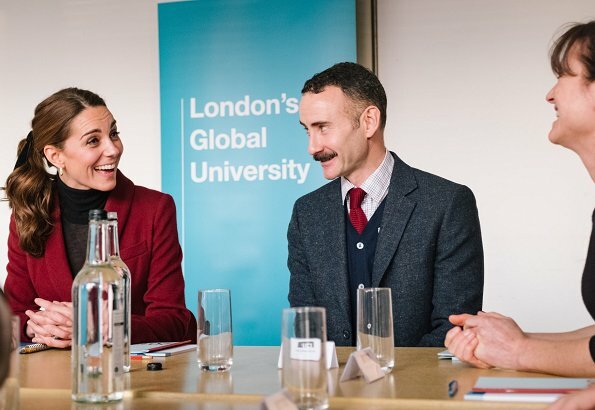 The Duchess of Cambridge's visiting UCL’s Developmental Neuroscience Lab, to see UCL Psychology and Language Sciences’ work into how environment and biology interact to shape the way in which children develop both socially and emotionally is a part of her well known project " Mental Health ", I think. Thank you Dear for putting “the light“ on the important cause. 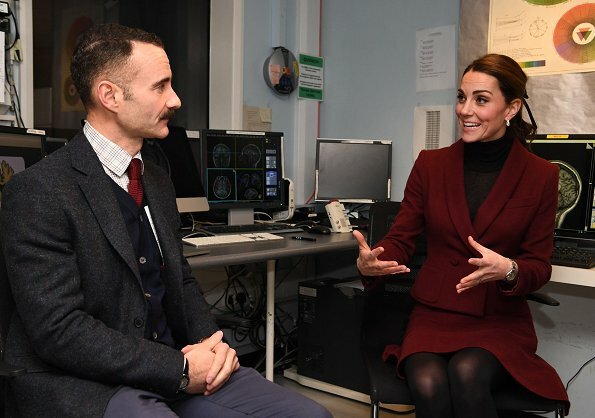 I think her visits are becoming more and more about the present and future work of the royal foundation on mental health and less about her clothes. She look great though. The skirt is a bit short but overall looks polished relaxed and yes very interested and professional. Like the whole outfit but don't think this hairstyle is flattering. Not sure why not as she looks so good with her hair up but something's not quite right. Davion, commenting on body shape in a fashion blog, is not inappropriate. The success of an outfit depends on the height, size and age of the wearer. To suggest that someone needs to gain or lose weight, change their make up or hairstyle is part of the discussion. Discussion of weight is not okay. It is body shaming. Saying a person to too thin or too big is never acceptable. I agree that there are styles of clothing that look better on certain body types. Designers are criticized if they don't have a full range of sizes in each design, no matter how bad it might look on some women. Pointing out a style would look better on a different body type is different than saying Kate needs to gain weight. Saying a person would look very nice with a different hair style is different than saying Kate is too skinny. It would be like saying she needs to grow 6 inches. Height, age and weight cannot be changed with a quick trip to the salon or stylist. Those are not things that should be shamed. I'm sorry how can you say that discussing a woman's weight on this sight is ok. Its definitely not ok and that what pisses me off about so many women commenting on this sight and all over social media about Catherine's weight. You can judge an outfit without being rude about someone's weight. Also all these comments about her looking old is getting so boring, shes about to be 37 soon everyone and she still looks fine and beautiful to me. Height and age can not be changed but weight can. It may be difficult but can be done. Look at acors/actresses who bulk up to play a particular part and then lose weight again or the various 'celebs' who gain/lose masses of weight and are photographed in unflattering photos in sections of the media. That is unpleasant and I agree verges on bullying. However to make a simple comment that she would look better if a little heavier is neither shaming nor bullying nor mean. There have been similar weight gain comments made about Letizia and weight loss comments made about Mathilde. They don't seem to cause this angry response! Recently there have been many positive comments made about Grand Duchess Maria Theresa and how much better she looks since she lost weight!! The few people who are panicked by comments on appearance don't seem to have a problem with those comments. 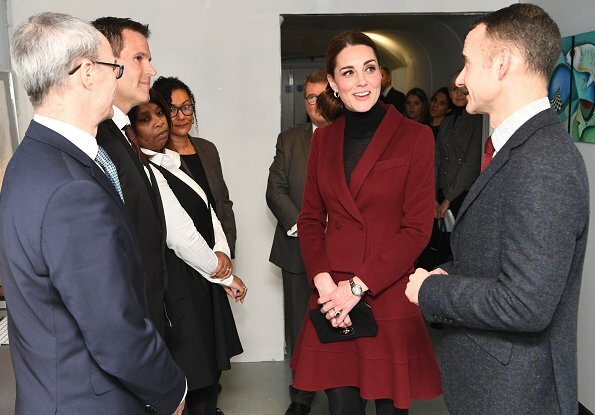 Comments have been made that Kate may be anorexic. That crosses the line. She appears to be the same weight she was before being married, and during her marriage. There are many pictures that support this, but we can't post pictures here. She may have gained a little more weight with the third pregnancy, which is not uncommon, and we saw her just a few weeks after giving birth at Harry and Megan's wedding. In other words, we saw her with more weight than we normally would have. Having that image of her in mind, then seeing her down to her normal weight might make it seem like she has lost more weight. It is a theory, but I think a plausable one. Lastly, it is not so easy to gain or lose weight for some people. Each body is different. Comments about a person losing weight and looking great are common, right or wrong, because people are generally healthier when they are not overweight. Also, our eye naturally likes certain proportions, which happen to be the heathier body weight. Commenting that a person should gain weight or lose weight is not anyone's business. Chardonn8r, that is the point! Speculations about anorexia cross the line! Dear friends...don' t make problems where they don't exist!! It' s everything about BEAUTY!! !....I mean, people just want to say what they would like to see...they don't argue about somebody's physical issues to hurt, but they want to see beauty, harmony, elegance and stile...and try to find it in another person.And I think that everybody is really nice and educated here on this blog.And I see that you admire everybody, but just want them to be perfect...even more then perfect but according to your taste.This is OK..it is not rude. I think is it rude. You can say that the outfit is too big or too small, short etc. for her but you do not have to say anything about her gain. So many people who do not understand that it is bullying. In Finland we have talked very much about the issue and how unacceptabelt it is, especially when it concerns youngsters. In this early morning I wrote something totally wrong😉. I tried to say that it is rude to talk about weight, not gain, but perhaps the most of you did understand. 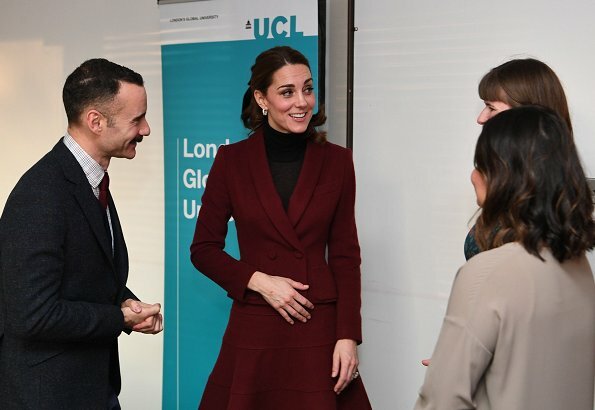 I like seeing Kate dress a little younger, but I do not love this outfit. The colors are beautiful on her, but this feels like it is for a generation younger than she is. I like her hair pulled back, but don't like the ribbon. I agree. THis outfit must not be 'recycled' again. Keep it for Charlotte. Hahaha. That’s an excellent idea. Keep it for Charlotte, completely agreed!! The skirt is too short ;and the whole look is a bit preppy okay if you are 21,not a mother of three.The hair is nice but could do with a nice hair clasp. I think this suit is fine, altough the skirt is a bit to short in my opinion. I don't like the turtleneck and black doesn't really suit her, it makes her look old, which she isn't. It's not her best look these days. I like the top but not the bottom of the outfit. The skirt is too short, and those greyish tights with black suede shoes are a big no for me. Why do you feel the need to constantly compare? That is just ridiculous to say. Only shows that there is no room for diversity in some people’s minds (never mind their hearts). Can we all refrain from that? It will benefit us all. There are many ways to be both elegant, dignified and appropriate-all whilst maintaining your own personality. Let’s accept that please. That's my opinion. And I'm sorry to say - just read the papers..Meghan this and Meghan that, Kate represents the Royals without big headlines. 😬 ...but hopefully it‘s just the press and not a bad habit of a former Hollywood actress who wants to put the spotlight on. She really does not need that anymore. Both women are pretty and stylish but for my taste Meghan plays too much in the foreground, her husband likes to do that too sometimes, especially with Meghan at his side. Unlike me, my son doesn‘t read gossip 😉 but even he gets this hype around Meghan. I don‘t think it’s good for the Royal Court to be constantly engaged in certain emotions. The headlines are made by the media, not by the Royals themselves. When the DoS (Meghan) steps out she does so to support a cause, as does the DoCa (Catherine). 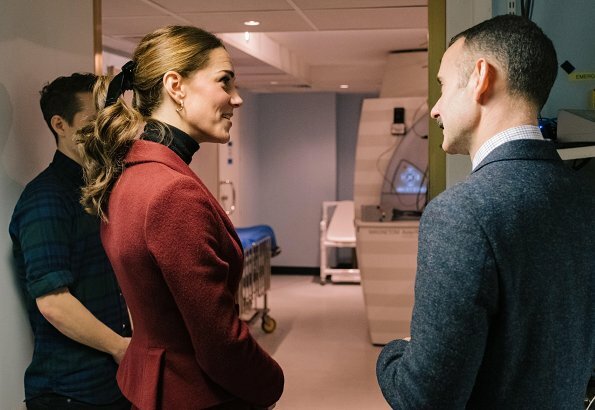 It's only the media coverage that might make a difference between the two of them, and to the media at the moment the DoS seems to be everybody's darling (her pregnancy might enforce this). We are much, way too much, in fact, influenced by what the media say. They're both for sure lovely women and wonderful assets to the British Royal Family. Monty, I think that is the question: Is it the media or the bad habit of a former actress? I for one love reading gossip (I admit that) and my perception is that Meghan is not everybodys' darling. She polarizes. Some people seem to see something like a fighter for diversity in her. Others think she is an immodest attention-seeker ("MeAgain Markle"). Some dislike this behaviour. Like Anne-Minni I prefer that "Classic English Rose"-Appereance of Catherine. GB is in so troubled times (Brexit) that I think every member of the BRF should try to give stability to the country and they do it best when following the motto "duty first". In English society, it is certainly good if someone stands for diversity. Unfortunately she doesn‘t seem to understand how her position in society has changed. As long as Harry is at her feet, she does what she wants. There is no way for not beeing influenced by gossip. Gossip is emotional and that is how mass media work, we all know this. They determine our emotions, decisions, actions behavior, habits, our character, our personality and how we act. Meghan did nothing wrong, she was working. I have to admit I´m infected as well. Publishing houses have trouble to survive and they have to write what people want to hear, clichees, stereotypes..
Nice to see her recycling her outfits, the skirt is a few inches to short but this is a matter of taste and opinion. But she looks good.